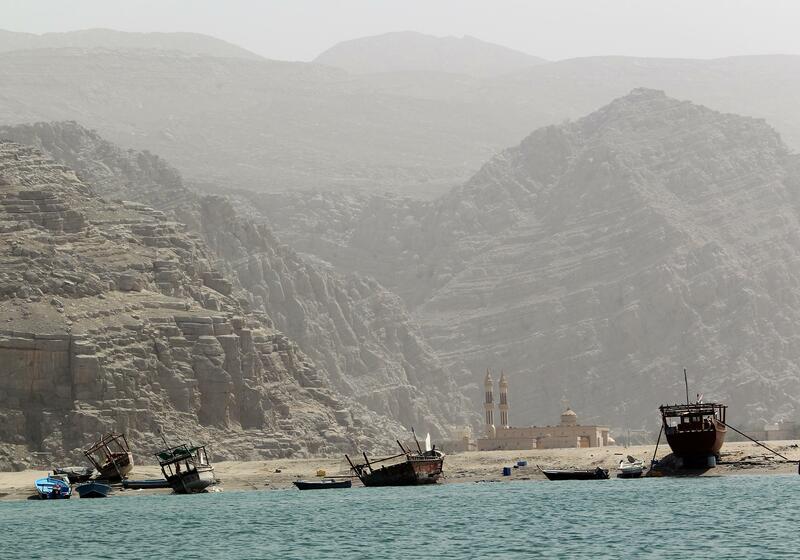 Old boats are seen along the coast line along the Strait of Hormuz off Oman on March 13, 2012. Iran’s Revolutionary Guard has seized control of a container ship, which the country’s media is misleadingly claiming is American. Revolutionary Guard patrol boats reportedly fired shots across the bow of the Maersk Tigris as it was crossing the Strait of Hormuz and directed it farther into Iranian waters. The Iranian military has now reportedly boarded the ship. The crew of the Tigris, which was on its way to the port of Jebel Ali near Dubai, issued a distress call, which was picked up by nearby U.S. forces in the area. U.S. naval aircraft have been dispatched to monitor the situation. There were inaccurate early media reports that U.S. sailors had been taken hostage, but according to the White House, there are no Americans on board. The ship was flying the flag of the Marshall Islands, a “flag of convenience” commonly used by ship operators to avoid regulations. But Iran’s state-run Fars news service is still quoting “informed sources” claiming that the ship was “owned by the U.S.,” even though Maersk is a Denmark-based multinational conglomerate and this particular ship was “managed by Singapore-based Rickmers Ship Management, which is part of Hamburg-based Rickmers Group.” Shipping experts say its owners include at least one U.S. firm, but it’s still a stretch to call it an American ship. Neither side appears all that clear on what happened. According to Fars, early reports suggested the ship had been trespassing in Iranian waters but now it appears the seizure was the result of a monetary dispute with the country’s ports organization. It’s unfortunately not completely far-fetched at the moment that Iran might have intended to seize a U.S. ship. U.S.-Iranian naval tensions are basically always high but have been particularly so recently due to the ongoing violence in Yemen. U.S. forces have been dispatched to the coast of Yemen to prevent Iran from shipping arms to the Houthi rebels who have seized the country’s capital. Last week American warships were reportedly planning to intercept an Iranian convoy suspected of carrying weapons, but the ships reversed their course. If the ongoing nuclear negotiations are leading to a larger thaw between Washington and Tehran, nobody has told the two countries navies, as Iran made clear in February by blowing up a scale model of a U.S. aircraft carrier.